NASA's planet-hunting Kepler space telescope, given a new lease on life after an endorsement by a science review panel last month, has resumed scanning the cosmos for the tell-tale signatures of alien worlds lurking around distant stars. 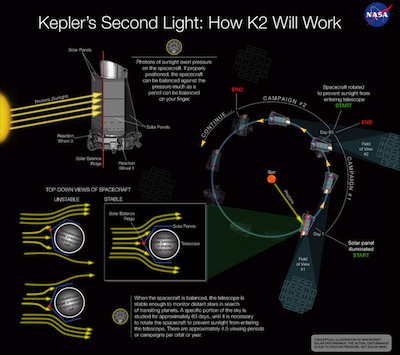 Kepler started taking science data May 30 in the first of nine observing campaigns through June 2016 under a two-year, $20 million mission extension dubbed K2 approved by NASA last month. Kepler is running on just two of its four reaction wheels, spinning gyroscopes which keep the telescope steadily aimed at stars to detect subtle fluctuations in light that might indicate the presence of a planet. But engineers with NASA and Ball Aerospace and Technologies Corp., Kepler's manufacturer, devised a way for the observatory to continue its planet-hunting quest despite its diminished capabilities. Instead of staring at the same field of stars, Kepler will pivot to point at different regions in the sky over the next two years, looking for the slight dips in the brightness of stars caused by the passage of a planet between its host star and the telescope. Engineers found a way to harness the pressure of photons of sunlight by positioning the spacecraft to prevent solar radiation from slowly pointing the telescope away from its astronomical targets. Although solar pressure exerts very low forces on spacecraft, the constant bombardment of solar photons can alter the orientation of satellites. Controllers can eliminate the effects of solar pressure by balancing Kepler against the stream of sunlight, similar to balancing a pencil on a finger. The telescope cannot detect the faint signatures of planets without stable pointing. The spacecraft orbits the sun at about the same distance as Earth. Five years since its launch, Kepler is now located about 50 million miles from Earth. Keeping Kepler balanced means it must be pointed in the ecliptic plane, or the plane where all the solar system's planets orbit the sun. The mitigation against solar pressure means Kepler can only look at a narrow band of stars, shifting its 100-square-degree field-of-view every two or three months to avoid pointing its sensitive 95-megapixel camera at bright sunlight. Each of the nine fields planned for study in the next two years are in the zodiacal constellations and contain between 10,000 and 20,000 stars for observations by Kepler's telescope. The K2 mission's 100,000 targets also include the very bright cores of galaxies, supernovae, asteroids and Neptune, plus aging stars identified as candidates for research into the convective processes inside stars, a field known as astroseismology. 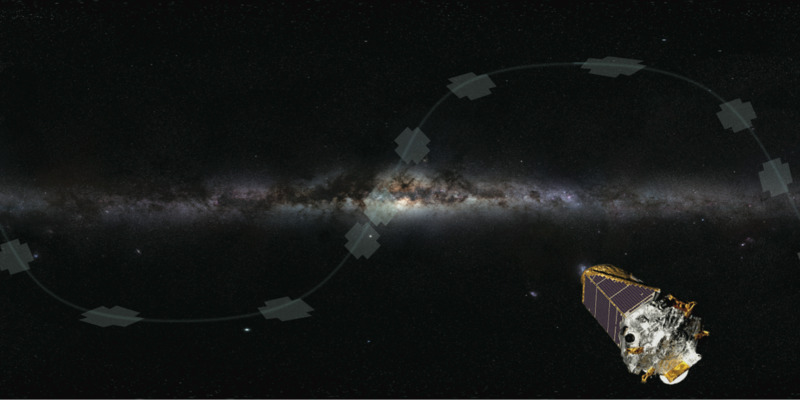 Scientists are still analyzing data collected during Kepler's four-year primary mission, during which the craft aimed its telescope at a field of more than 150,000 stars in the constellations Cygnus and Lyra. Astronomers sought an Earth-sized planet at just the right distance from a sun-like star in hopes of discovering something like an "Earth analog" where life could exist. Astronomers believe they have found hundreds of giant Jupiter-sized planets, some circling hellishly close to their parent stars. 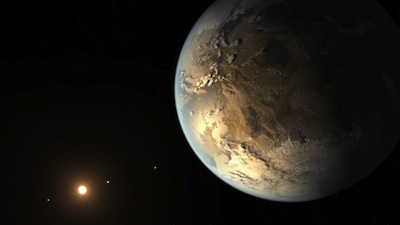 Scientists are more interested in spotting planets in the habitable zone, a "Goldilocks" band where temperatures are just right to sustain liquid water and life. Smaller planets in orbits farther out from their hosts take more time to confirm, with scientists needing several "transits" to verify the dip in starlight is actually from a planet. For planets like Earth, such a discovery would take several years of observations to validate. "We've found that Earth-sized plants are very common, they're often in the habitable zone, and they're around all types of stars," said Bill Borucki, Kepler's principal investigator at NASA's Ames Research Center in Moffett Field, Calif., in a press conference last year. Kepler's haul of exoplanets now stands at 974 confirmed discoveries and more than 3,800 candidates. The K2 mission will only look at the same stars for about 75 days, so scientists will change their focus to look for potentially habitable planets around stars cooler than the sun. Worlds circling such stars could orbit much closer -- and complete multiple transits in quicker succession -- and still have temperatures hospitable for life. Kepler lost its second reaction wheel in May 2013, rendering the telescope unable to continue the mission as it originally conceived. The wheels spin in two directions between 1,000 and 4,000 rpm, generating momentum to maneuver the spacecraft and keep Kepler's 3.1-foot telescope precisely pointed. Two wheels alone are insufficient to carry on Kepler's original mission, and the spacecraft's chemical rocket thrusters do not have fine pointing ability. The new mission concept was designed and demonstrated in less than a year, culminating in a mock science campaign this spring to prove its viability. "We took nine days of fine-pointed data in February in our first attempt at an extended operation in the ecliptic," wrote Charlie Sobeck, Kepler project manager, in an email to Spaceflight Now. "Then we did a full-length engineering campaign (designated as Campaign 0) as an end-to-end system shakedown." Sobeck said officials will deliver data from Campaign 0 to scientists after it is used to validate Kepler's data processing software. The practice proved Kepler's new operating paradigm works, and NASA approved a request from mission officials for another two years of funding. Kepler's budget is approximately $10 million per year, according to Sobeck. NASA's green light for extending the Kepler mission came after a positive recommendation from a panel of senior scientists, which reviews the space agency's operating astrophysics missions every two years and decides whether NASA should still fund the projects. Kepler's extension came with a decision to keep funding the Hubble Space Telescope, the Chandra X-ray Observatory, the Fermi Gamma-ray Space Telescope and other missions. But NASA's scarce astrophysics budget meant one of the agency's famed Great Observatories, the infrared Spitzer telescope, was tagged for termination. 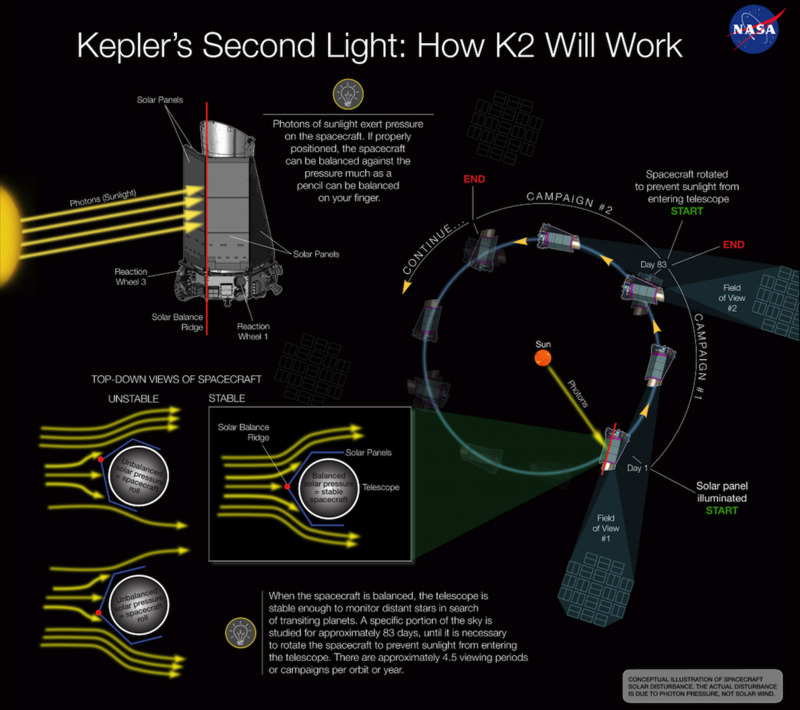 Sobeck said engineers will monitor Kepler's two still-spinning reaction wheels over the next two years. "We have not done any planning for the failure of another reaction wheel," Sobeck wrote in an email. "A two-wheel mission was challenging enough -- I don't believe there is a viable one-wheel mission scenario. However, we are watching the remaining two wheels closely and we have not yet seen any of the symptoms that we associate with a wheel that is stressed."